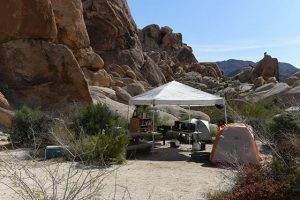 Indian Cove in Joshua Tree National Park is located on the west end of Twentynine Palms city limits, and it is reached by turning south off of 29 Palms Highway (Hwy 62) on Indian Cove Road, which dead-ends at this secluded area. A sprawling campground is enclosed by towering rock formations, making the area popular with rock climbers. Many campsites are tucked around the rocks, providing naturalistic tent camping. Other sites offer space for RVs. There is a separate camping area for groups. On the west side of the campground, the half-mile Indian Cove nature trail highlights the plants, animals, and seasonal Indian occupation of the area. A picnic area is located on the far eastern side of the campground. For backcountry campers, the Indian Cove backcountry registration board area provides parking and the Boy Scout trailhead. Indian Cove features a campground, picnic area, amphitheater, self-guided nature trail, and rock climbing areas, and it also is the source of the Boy Scout Trail into the park. When you turn south off the highway on Indian Cove Road, drive to the ranger station, where parking is available. The Boy Scout Trail starts a short distance away. 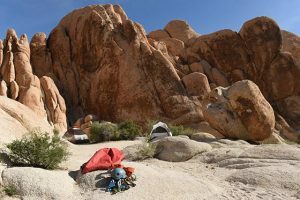 To access the Indian Cove campground, amphitheater, picnic and climbing areas, continue on the road. Indian Cove has 101 campsites, including 13 group campsites. There are vault toilets, but no showers and no water in the campground. Campers register at the ranger station located at the entrance to the Indian Cove area. Water is available there. Reservations are available at Indian Cove Campground during the busy season from October through May. Book a site online at www.recreation.gov or by calling 877-444-6777 up to six months in advance of your visit. Group campsites are reservation only. Campgrounds are open 24 hours a day. Check in and check out are at noon. Quiet hours are from 10:00 p.m. to 6:00 a.m. Note: Cell phone service is spotty and unreliable, and there is no Internet connectivity. 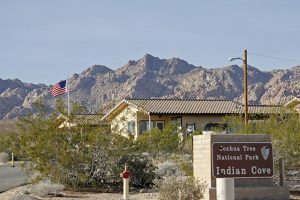 Alert: Because of the park’s very dry climate, fire danger in Joshua Tree is almost always very high. Be cautious. Campfires are allowed only in designated fire rings or grills that are found in park campgrounds or picnic areas. Keep fires small. Bring your own firewood. You may not gather park vegetation, whether living or dead, to fuel your campfire. If you plan to have a campfire, bring extra water to douse it thoroughly.